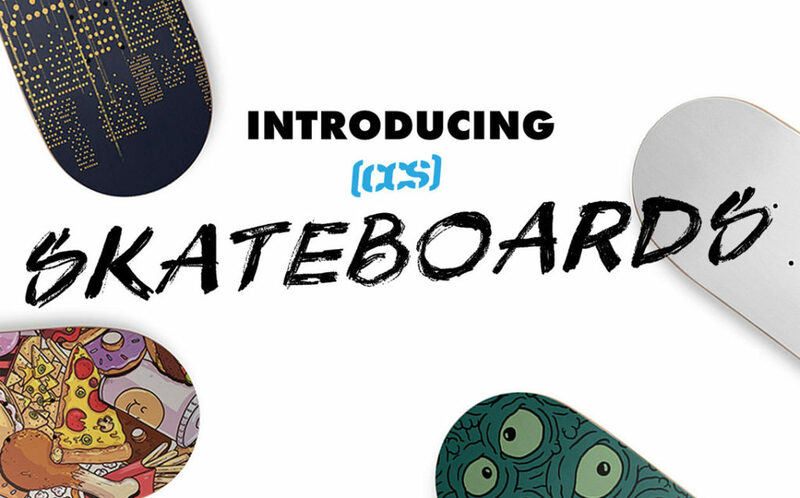 Skaters, rejoice: Skateboards are officially HERE! Ride in style with brand new CCS custom skateboards* featuring some of your favorite Threadless designs. Not a fan of boarding? No problem! These decks also make most excellent pieces of wall art that can deck out any gallery wall. And right now they’re 30% off! Made out of trusty 7-ply Canadian maple material, these decks are super durable whether you take them to the pavement or just hang ’em on your walls. Go on your own adventure with “Mister Mittens’ Big Adventure“. Hang “The Hanging City” up on your gallery wall to mix it up. Be eye-catching with “Green Googly Eyes” on your commute home. These decks come in a variety of four different widths and range from 31-32” inches long. Skateboards will start shipping in mid-late October. Preorder now! *Grip tape, wheels, bearings, trucks not included. The skateboards with hanging hardware come with one unassembled, clear polycarbonite Sk8ology deck display plus some hardware for easy display. Check product description for more details. Posted in Blog, News and tagged skate culture, skateboard designs, skateboards, skaters, threadless skateboards. Bookmark the permalink.